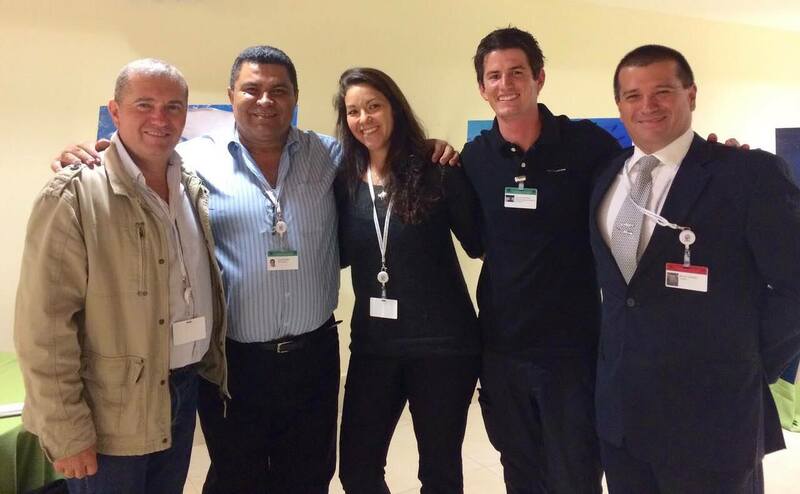 Triumph for Manta alfredi and other sharks and rays at CMS CoP11! An almost palpable momentum for elasmobranch conservation continues with a clean sweep at the Convention for Migratory Species CoP in Quito Ecuador today. MMF Ecuador’s team was on the floor as 21 species of threatened sharks and rays are successfully listed on the appendices of CMS. With so many species nominated, sharks and rays came away as the big winners at CoP11. In summary, all five sawfish species, all nine species of Mobula (devil rays), and the reef manta ray have been listed successfully on Appendix I & II, which should bring about stricter protection for these species globally. Two species of hammerheads (the great & scalloped), all three thresher shark species (the bigeye, common and pelagic), and the silky shark have been awarded CMS Appendix II listing, which should encourage regional cooperation for the management and conservation of shared populations within range states. If you feel like there has been increasing support for shark and ray conservation lately, you are right. Since the CITES CoP in Bangkok in 2013, governments around the world seem to be taking the dire conservation listings of many threatened shark and ray species more seriously. Today we saw them banning together in a precautionary attempt to save remaining populations – unanimous in their willingness to re-think the health of our oceans. The recent paradigm shift is a timely turn-around since the latest reports from the IUCN’s Shark Specialist Group (SSG) reveal that nearly 25% of all shark and rays species are threatened with extinction. In some ocean, shark species have declined by up to 90%??? As both indicator species and keystone predators, the disappearance of sharks in our oceans is an ominous sign, one that should not be ignored. 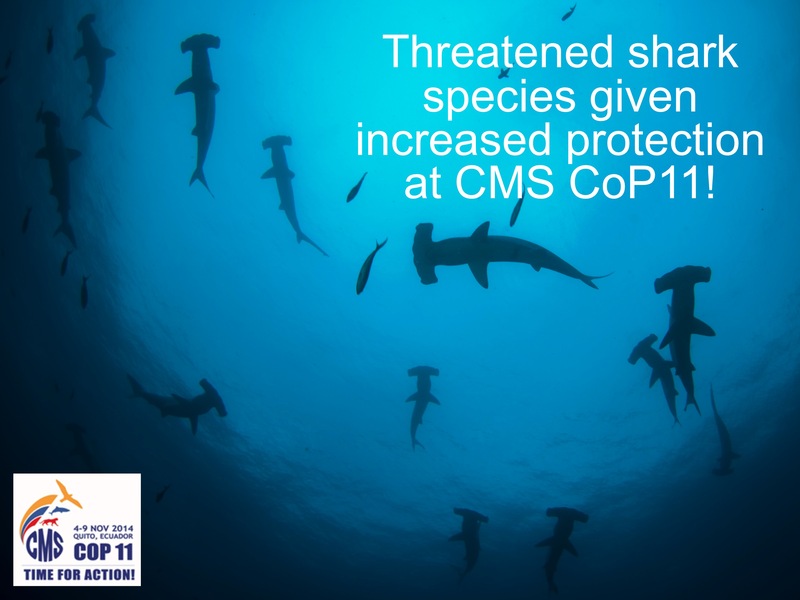 CMS, which is the only inter-governmental treaty that deals with the global protection of migratory species, is incredibly important to ensuring that threatened species, like sharks, which regularly cross international or jurisdictional boundaries are offered more support. Ultimately CMS listings encourage national-level protection within range states, prompt better regional management of populations and help to facilitate much needed research on these threatened species which desperately need to be better understood. All week our team in Ecuador has been lobbying for support of the shark and ray proposals, strategizing with other NGOs and preparing materials and presentations to support the listing of these 21 species. It was a complete whirlwind of excitement and stress as we clamored to gain the majority support from Parties. 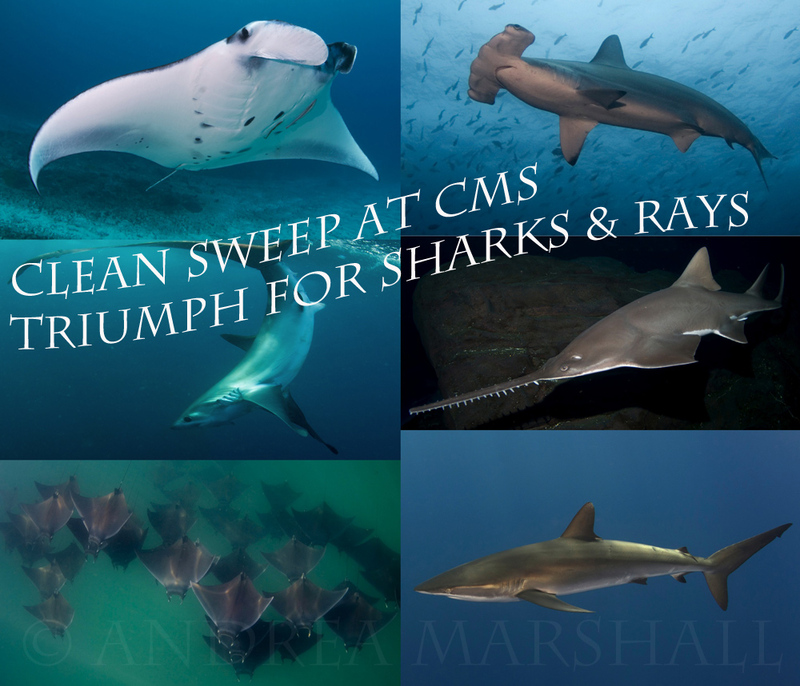 In the end though, the long hours spent at the CoP and the years of preparatory scientific research all paid off in a single moment with unanimous support for each and every shark and ray proposal, the biggest victory for the group in CMS history! It was so lovely to have such unwavering support from the Ecuadorian Ministry of the Environment. Ecuador who is the host country for this year’s Conference of Parties is also an international champion for shark and ray conservation. On many occasions, it has been this small, unassuming country that has put forward game changing proposals to protect threatened species like the hammerhead sharks or the giant manta on CMS and CITES. Even more importantly they serve to remind other countries of the responsibility toward listed species after the CoP is finished. As someone working on migratory species research and conservation in Ecuador, it is clear that the Ecuadorian ministry of the environment not only prioritize research and management of migratory species in their country but they want to invest in education as well, something that is critical to the success of any conservation initiative. Reflecting back on what has been both an exciting and pressure-filled week, I can say that it has been a privilege to be apart of this historic event and help in our small way to usher in a new era for sharks and rays, one that will hopefully see them more appreciated and better protected. Congratulations for all this team !!! !